The Barn Dance wedding invitation is the sort of invitation that can be enjoyed on a number of levels. According to the people behind the invitation, it is a stylish card that currently taps into the hipster trend. You know what modern life is like, there is a great fondness for things that are slightly old, rustic and perhaps previously uncool. 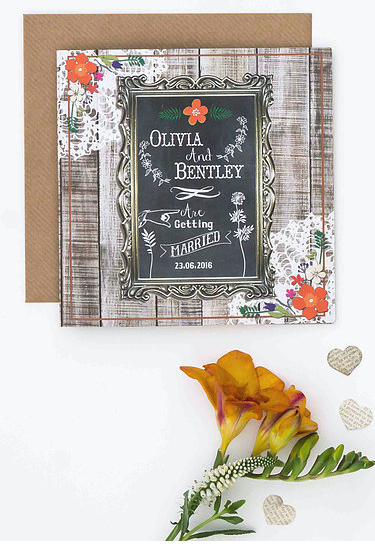 Taking something naff and giving it a modern twist or reclaiming it in modern times is an excellent way to mark yourself out as being different from the normal people, and if this is the sort of style appropriation that pleases you, you’ll find that the Barn Dance wedding invitation is right up your street. Of course, there will be plenty of couples who genuinely appreciate the style and imagery of a barn dance. There may not be illicit moonshine on offer at the celebrations but if there is likely to be a hoe-down with plenty of people having a great time, this could be the wedding invitation that tells everyone what to expect. There is a rustic charm to the invitation but it is clear and it provides everything that your guests need to know while being stylish enough for guests to want to hold on to the card and invitation. With a range of additional stationery items, the happy bride and groom can go “all-in” for the barn dance style if they want, and if there is going to be a big party; this is the sort of invitation that tells your guests to bring their dancing shoes to the special event, order from Herta’s Creative Design.